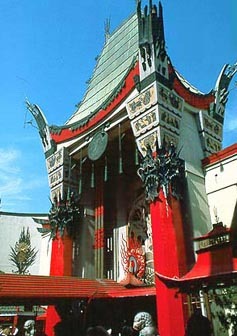 With all the new energy being focused on the stretch of Hollywood Boulevard near this true local landmark, and with the Kodak Theatre as the new home for the Oscars only a quick walk down the road, Mann's Chinese Theatre didn't quite remake itself, but did change its name to Mann's Grauman's Chinese Theatre. 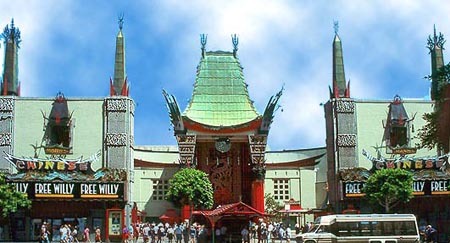 Opened in 1927 as Grauman's Chinese Theatre, its legendary outside area, known as the Forecourt of the Stars, is the place of lore where stars of today and the past have dipped their hands or feet in cement, forever giving fans a chance to measure up to Gary Cooper, Mary Pickford, Tom Hanks, Robin Williams, R2-D2, etc. The regal design, based on a Chinese pagoda and featuring a large dragon and stone lions guarding the entrance, is the perfect balance between kitsch and class. Inside is one of the biggest screens imaginable, with state-of-the-art sound and old-school elegance, though it does seem a bit dingier today than it would have 70 years ago. Still a good place to catch an "event" flick where the huge image is the thing, and truth be told, even the most cynical Hollywood observer can find themselves caught up in the magic when walking through its hallowed doors.